Zoologists are biologists who study the structures, characteristics, functions, ecology and environments of living or extinct animals. They do this in order to increase scientific knowledge and develop practical applications in wildlife management, conservation, agriculture and medicine. As well as observing and studying animals, zoologists may spend time writing research articles and reports. They can also be involved in conservation, protecting endangered animals and their habitats. Zoologists may find jobs working for government agencies, non-profit organisations, universities, museums and zoos. As part of their job, zoologists may find themselves organising field research studies of animals in their natural habitat; studying specimens under microscope in laboratories; fundraising; writing reports and scientific articles; making presentations to schools and interest groups; identifying and classifying animals; estimating wildlife populations; developing programmes to increase or manage the population of wild animals and animals in captivity; supervising and coordinating the work of technical officers and technicians. Why did you choose zoology? Animals are my passion: big, small, wild and domestic. Africa is home to some of the greatest diversities and spectacles of animal life in the world. I love the outdoors and this profession gives me the opportunity to work with what I love and have a passion for, and to help preserve one aspect of Africa’s rich heritage. What training did you undergo? I completed an undergraduate degree at King’s College, London and, soon after, a master’s degree at the University of Nairobi. After that I worked in Kenya for four years as the Wildlife Officer at a local wildlife park. 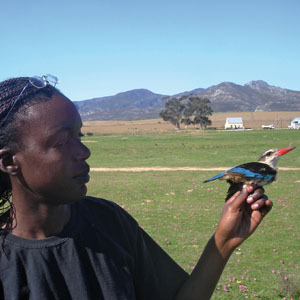 I am currently doing my PhD at the Percy Fitzpatrick Institute of African Ornithology, a Centre of Excellence at UCT. Is there a type of personality best suited to zoology? Working outdoors can be challenging at times, so it helps to have an appreciation for the outdoors beforehand. Persistence and focus are important, so a self-motivated character will do well. How does experience weigh up with formal training? Although formal training has substantial benefits, I believe experience can sometimes be even better. When it comes to nature, some things can only be learnt through direct experience. Describe a typical day at work In the office, I am mainly occupied with looking down the microscope, trying to identify various things from my field data. In the field, it’s an early start at dawn or before – my research involves counting, catching (and release) of birds, so we do this for most of the day. Your favourite parts of the job? I’m always learning. There is always an opportunity to discover new things about the natural world, both in the field and in the lab. Which aspects aren’t you too keen on? Getting up at 4am on a cold winter’s day to go out into the field – this can be challenging, no matter how much you love your job! What’s been the highlight of your career? During my time as a wildlife officer, I organised teams to conduct wildlife translocations – moving animals from one place to another. These operations are often risky and involve intense planning and practise, so it is always satisfying when they go well. My personal highlight came when we successfully managed to move two hippos into an enclosure we had specially designed for them. Seeing them thrive and get to know each other in the enclosure was very gratifying. Meeting David Attenborough recently was wonderful. Any advice for newcomers to the field? Follow your passion. To enjoy it, you need to love it. A Bachelor of Zoology degree is commonly a minimum requirement for entry-level jobs, while further qualifications are usually required for higher-level research jobs. A PhD is needed for most positions involving original research and developing plans for conservation or management. A National Senior Certificate that meets the requirements for a degree or diploma course is a prerequisite. Zoologists usually specialise in one aspect of study such as entomology (insects), parasitology (internal and external parasites), ecology (environment of animals), ethology (animal behaviour), ichthyology (fish), mammalogy (mammals), ornithology (birds), herpetology (reptiles) or physiology (functions of animals). Postgraduate research projects are chosen according to the particular area of interest and specialisation.